One thing many golfers tend to overlook is their shoes. Not only do you need the right shoes to stay comfortable during the long walks, but there’s also the matter of making your shot. Even if you have the most comfortable shoes ever, are they prepared to help you when you come across some wet grass? Whether you’re playing in the rain, early in the morning after a fresh layer of dew, or simply have to knock your golf ball away from the water hazard, it’s important to prepare for the possibility of wet conditions. There’s nothing worse than the feeling of water in your favorite pair of golf shoes. Not only that, but standard shoes don’t provide the right amount of traction to stay upright and safe. 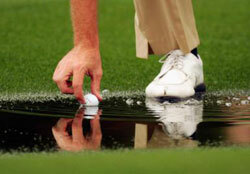 Instead of letting water affect the way you play, it’s a good idea to invest in some quality waterproof golf shoes. These specially-designed kicks will make trucking through wet conditions a breeze as your make your way through the course. Here are 8 of the best waterproof golf shoes to keep you comfortable and on your A-game. Made from tumbled leather, these shoes from Ashworth have a great look and soft feel. Inside, there’s a soft EVA midsole and adequate cushioning for a full day of walking. Where this shoe shines is in the outsole. It has a spikeless outsole that’s designed to improve traction on any surface. Numerous pegs take hold of the ground without affecting the quality of the grass. The outsole is also very flexible, increasing the shoe’s overall comfort level. It’s available in a variety of colors to fit any man’s style. The Contour Casual shoes from FootJoy are a great golf shoe for any condition. They’re incredibly lightweight and have a cushioned sole inside for maximum comfort. There’s even a rigid portion in the sole to improve stability while you swing. To prepare you for wet conditions, the entire shoe is waterproof. The leather uppers look great and are completely sealed to prevent leaks. The bottom of the shoe features a traditional peg design. It grips onto slippery terrain for improved stability on the course. This waterproof shoe is made from a combination of materials, including synthetic rubber and Yak leather. It’s has a unique HydroMax waterproof construction that reinforces every seam for a watertight fit. However, the shoe does contain various points of ventilation. This helps keep the feet dry and comfortable. The soles have a molded cleat design for improved traction. The insides of the shoe are molded to achieve a snug fit. The shoes are also very flexible and lightweight to remain comfortable throughout the day. Another great option from FootJoy, these shoes feature a unique spiked cleat. Numerous spikes are positioned along the heel and ball of the foot. They dig into the ground slightly with every step, anchoring you in position. Despite the spikes, the shoe is noticeably light. It’s made from leather and has a waterproof construction. Ventilation holes provide air circulation inside the shoe and keep the feet dry. The contoured footbed conforms to the shape of your foot while providing shock-absorbing benefits. From Nike is this pair of sleek and modern golfing shoes. The uppers are comprised of ripstop mesh for breathability. However, hard TPU is overlayed on top. This results in a protected shoe that keeps your feet dry. The shoes are also designed to be lightweight and flexible. The bottoms feature a spikeless traction system that combines a number of different tread designs. A combination of grooves, pegs, and water channels will keep you standing. It has a Dynamic Fit system to ensure a comfortable fit. True to the Nike brand, these shoes are available in a number of different designs and colors. This option from Puma is pretty basic in terms of style, but it packs a number of great features. The shoe is made from leather and synthetic materials. The outsole is made from leather. It uses a combination of spikes and pegs to provide traction on slippery grass. Inside, Puma included unique technology to keep you comfortable. A PWR insole regulates the temperature. It can help cool you down and prevent sweating or discomfort as you make your way through the course. Also from Puma, the Biodrive golf shoe can get you through a slippery game of golf. The upper features a mesh material that improves breathability while making the shoe waterproof. The mesh repels water away and prevents absorption. The sole is made from synthetic materials, making it surprisingly flexible and lightweight. It incorporates a unique tread design composed of octagons. Various connected octagons redirect water with every step while gripping onto the ground. With numerous colors available, there’s an option for any guy. If style is what you’re after, this Oxford is a great option. It’s a bit heftier than other golf shoes, but it contains a bevy of great features. The upper is made from waterproof microfiber and incorporates a sealed membrane to keep moisture out. Should water enter the shoe, the removable insole wicks it away to keep your feet dry. Adequate support and cushioning in the midsole will improve comfort. The TPR rubber outsole has a number of spikes to improve your grip on the course. It’s has a very polished look and is designed for any playing condition. 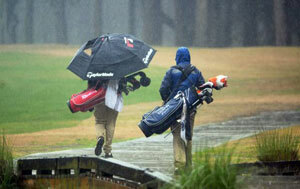 The advantage of wearing waterproof golf shoes is that it frees you of distraction in any playing condition. Wet shoes and socks aren’t only annoying, but they pull focus from what actually matters: your golf shot! Without having to constantly worry about water, you can stay comfortable and ready for anything. These shoes also help to improve your technique on a slippery course. Standard shoes will only get slick, causing you to lose traction. Essentially, all that amazing technique you have is useless. With the right shoes, you’ll stay firm on the ground and play the same way you would in dry conditions. When you’re on the lookout for waterproof shoes, there are a number of things to consider. Not only should you focus on the shoe’s waterproofing abilities, but it’s performance as a standard golf shoe as well. Waterproof golf shoes need to be comfortable above anything else. While most golfers don’t realize it, they could end up walking miles as they play a game. Ill-fitting shoes will cause you to feel fatigued faster and possibly lead to some injuries. Not only that but you’ll see the effects of your discomfort when you play. Shoes should fit like a glove. They need to feel comfortable and light through regardless of how much you’ve already walked. Take a look at the inside of the shoe. A soft lining and adequate cushions on the midsole will support your foot and prevent chaffing. Numerous different materials can be used on waterproof shoes. The most common material used is leather. Typically, this leather will be treated to improve longevity and durability. Other materials like synthetic leather and composite materials are also used. Cheaper fabric materials should be avoided. These aren’t great for keeping water out and can actually soak up moisture and lead to mold. The quality of the material can play a huge role in its effectiveness, comfort, and price. It’s important to consider what material is best for your needs in terms of wearability and performance. Designing a waterproof shoe isn’t as easy as slapping together waterproof materials. The various components of the shoe have to be constructed in a way that prevents water from seeping through. Furthermore, the shoe needs to have ventilation to retain its comfort. All of these aspects are important to go over. When looking at a pair of waterproof golf shoes, pay attention to the seams. This is where water will typically enter a standard shoe. Seams should be tight and perfectly sealed. Other areas to check out would include the connection of the soles and uppers as well as any ventilation holes. Also, examine the shoe’s flexibility. Hard and rigid shoes will cause massive discomfort as you walk. Look for a modern golf shoe that’s built using a flexible sole that moves with the contours of the terrain. High-quality soles will help prevent slippage on the course. The treads on the bottom will improve grip on wet surfaces, including grass. On standard shoes, the treads are simple to provide traction on basic surfaces. However, waterproof shoes need a special design that redirects water away from the sole and grips into the ground. Like the treads on a car tire, the soles should have various water channels and pegs. While the exact style of tread and sole differs between manufacturers, it’s important to look for a sole that can keep you grounded. A great pair of waterproof golf shoes will have you prepared for anything. These shoes will prevent water from causing you discomfort as you make your way from hole to hole. They’ll also keep your grounded, ensuring that your technique isn’t lost. Ultimately, you’ll see a vast improvement in the way you play regardless of how slippery or wet the course is.